The Aesthetics Committee is working hard to bring you some exciting news about rain-harvesting and other water conservation measures! Please continue to check this page! Have you ever wondered how a rain barrel could help your garden, and your wallet? Click HERE to watch an informative video about rain barrels. You can also contact Trinity Glen Rose at 210-698-1155, or mail@trinityglenrose.com, to ask questions, or find out how you can locate a workshop near you. Visit them online at www.trinityglenrose.com. Charles Martelli’s landscape haven, known as Milberger’s Landscape and Nursery, is 25 acres of beautiful plants, shrubs, trees and anything else you can think of that will brighten your own home’s landscape. But, a colorful yard is only part of the Martelli mission. He is very much interested in helping people save water and protect local aquifers. That is why it makes so much sense that the Trinity Glen Rose Groundwater Conservation District (TGR) partner with Milberger’s in creating awareness about the Trinity Aquifer and the work of the Trinity District. Starting March 1, Milberger’s will be offering a $25 coupon for anyone signing up to receive the Trinity Glen Rose monthly newsletter at the TGR website. Those who already subscribe will also have the same opportunity. You should visit www.TrinityGlenRose.com for more information. Good through the end of May. 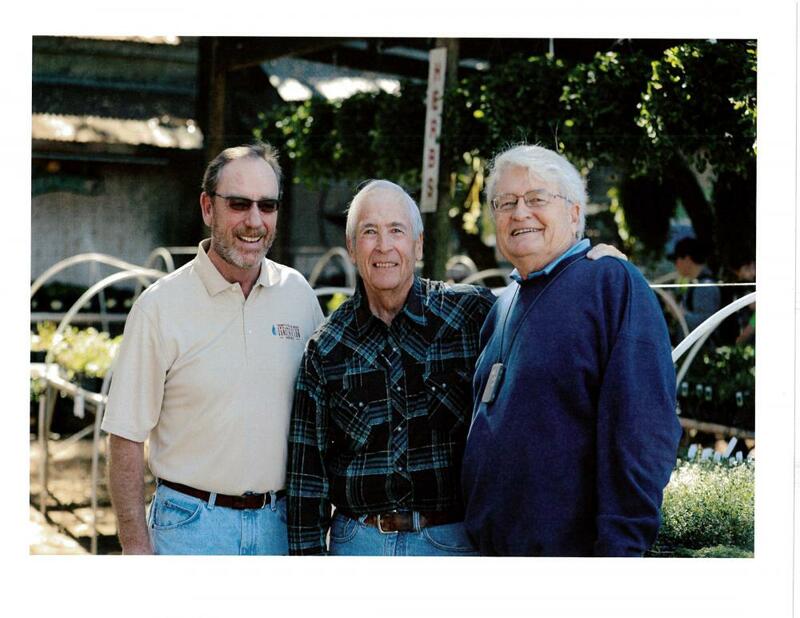 Finch is one of San Antonio's foremost experts on horticulture and water-saving landscapes. After retiring from a successful career in Horticulture and Water Conservation with Texas A&M University and the San Antonio Water System, he continues to appear regularly on television and radio in the San Antonio area. Finch also has a weekly horticulture column published in the San Antonio Express-News and six other South Texas newspapers. Dr. Finch’s work in water conservation, horticulture, the media and with volunteers has garnered numerous state and national awards. He received a Ph.D. from Texas A&M in Horticulture. Aerate and top dress your lawn. Use an aerator that cuts and removes a plug of soil which it places on the soil surface. The machines can be rented or the service purchased. Apply one half -inch of compost after the aeration. The compost penetrates the aeration holes to bring organic material into the root zone. It is too early to fertilize. Wait until real grass has been mowed twice. Apply a pre-emergent herbicide to reduce summer weeds from germinating. This is especially important if you were bothered by sandburs and/or crabgrass. Halt, Dimension, Crabgrass Preventer, Amaze and XL are good herbicides for the job. Note that a second application should be applied in mid-June. To be ready for the hot weather when it arrives, call in your irrigation contractor to check out and repair your system. Make sure the rain sensor is working and all leaks are repaired. Have him/her instruct you how to change the watering amounts if necessary. Have your mower blades sharpened and the engine tuned up. Mow in March to keep the lawn weeds in check. To view an entire year’s worth of landscape recommendations, visit the new Trinity Glen Rose landscape page at: www.TrinityGlenRose.com/landscape. Winter Irrigation Makes Your Sewer Bill Grow….Not Your Grass! Ok everyone, let’s have a show of hands to see how many of you are currently running your irrigation systems at least once per week in the Stone Oak area? Hmmm……I don’t see a lot of hands, but in my travels through the area through the week, there are a lot of “irrigation signatures” in and down the streets in front of homes, indicating irrigation has run within the past minutes or hours. First, you must understand that irrigating dormant grass will not make it grow, no matter how hard you try. As long as soil temperatures are below 70oF, turf grasses will not produce green shoots. Only the roots of grasses, trees and shrubs are active in the winter. What WILL turn green are the germinating winter weeds like dandelions and henbit, along with cool-season weedy grasses such as rye, fescue, Poa anna, or Rescue grass. Why is NOT irrigating in the winter important? Your sewer bill. Yes! Your sewer bill! SAWS uses the period between November 15 and March 15 each year to calculate the winter average. The winter average is a consecutive 3-month period used to calculate the sewer bill for the following year. Why use the winter? Water use for residential customers in the winter is ASSUMED to be primarily occurring indoors, and thus exiting the property via the sewer pipes. Wastewater output is not metered for SAWS customers. That’s not a job ANY meter reader would want…hee hee! Normally, a good winter recommendation is to apply ½ inch of water to the landscape every 4 weeks since the grass/plants are not actively growing. However, a rainfall of ½ inch or more is enough to delay irrigation for at least 4 weeks in winter. Soil depth is very important in the water needs of plants and grass for winter. Soil at least six inches deep or more will hold moisture longer, requiring less frequent irrigation or rainfall. Landscapes with soil less than six inches deep may require some kind of irrigation or rainfall at least once every two weeks. Shrubs and trees require less water than grasses in winter and usually do well on rainfall alone. If water is needed, use a hand-held hose to apply water to individual shrubs and trees once or twice during the winter and use irrigation sparingly on grasses. While most winters in San Antonio are mild, they are still cool enough to keep warm season grasses (St. Augustine, Bermuda, Zoysia, Buffalo) from growing and remaining emerald green. These grasses do not need lots of water to survive the winter. Using extra water outdoors in the winter does nothing but make your sewer bill grow for the following year. Next time you’re in the garage, stop by your friend “Hunter” or “Rain Bird” (whatever your brand of irrigation controller) and switch them to OFF or Manual until after March 15. Don’t you just love winter weather in South Texas? One day your wearing shorts and out for a walk. The next day your worrying about a freeze killing your plants and maybe even breaking your water pipes. So, the best advice for making sure you don’t find yourself without water because of a frozen water pipe is to be prepared. If your remember a few things from your chemistry classes, water has a unique property in that it expands when it freezes. Obviously, that expansion can put lots of pressure on the water pipes at your home, and that’s when problems can occur. In fact, if your pipes aren’t insulated, and the temperature drops below 20 degrees, they can become frozen and crack. Pipes that freeze most frequently are outdoor hose bibbs, swimming pool supply lines, water sprinkler lines, and water supply pipes in unheated interior areas like basements and crawl spaces, attics, garages, or kitchen cabinets. Pipes that run against exterior walls that have little or no insulation are also subject to freezing. Also keep in mind that some of the Trinity Glen Rose District lies in the foothills of the Texas Hill Country, and temperatures can get a little colder there as compared to the middle of San Antonio. Here are a few suggestions for keeping those pipes ready for those bitter winter blasts that blow through on occasion. Disconnect water hoses from the hose bibbs. Buy some pipe insulation from your local hardware store and wrap that insulation around the exposed hose bibbs at your home. You might need a little duct tape to secure the insulation. If you have a sprinkler system, make sure you turn it off. You really shouldn’t be watering your yard this time of year anyway. Grass hibernates over the winter months and prepares itself for the growing season in the spring. If you plan to be away from home for several days, shutting off the water can reduce the chances of broken pipes. Also, keep the heater on in your house with the thermostat set to around 55 degrees. Be a good neighbor. If your neighbor is away or you are next to a vacant house and you suspect a water leak, call your water service provider immediately. You’ve probably heard that letting water drip from outdoor faucets can help prevent freezing pipes. Well, that is true, but it also wastes water. By being prepared for a sudden drop in temperatures and insulating those outdoor faucets, you should be able to avoid having to let your faucets drip. You can always call a licensed plumber for help. 11-2-16 Did You Know Some of Your Water Comes from the Trinity Aquifer? 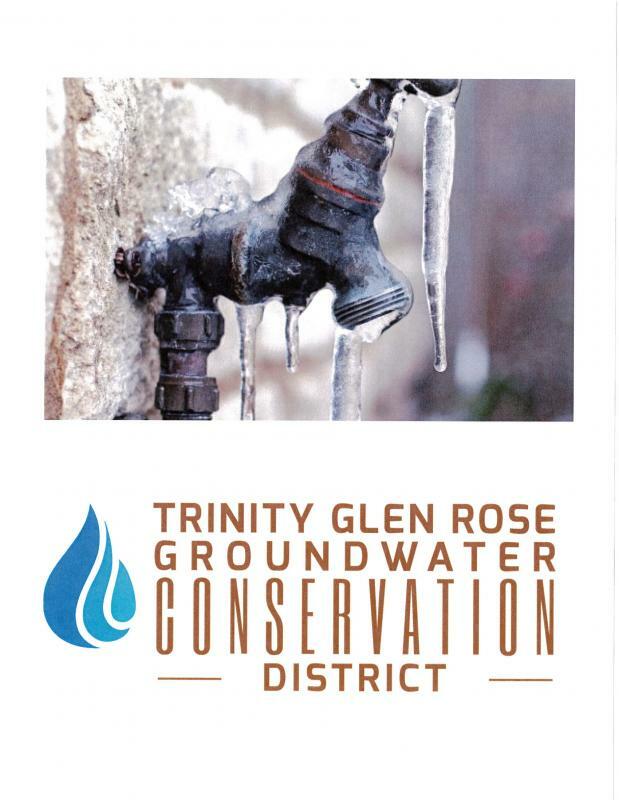 Greetings from the Trinity Glen Rose Groundwater Conservation District (TGR). We are collaborating with the Stone Oak POA in offering Stone Oak residents the opportunity to sign up for the TGR e-newsletter. And there are many important reasons for your family and/or business to do so. A quality, reliable water supply is the lifeblood of every community, and it is the responsibility of homeowners, businesses and various water agencies to make sure excellent water is always available in San Antonio. Much of the water that is used in Stone Oak comes from the Trinity Aquifer in addition to the Edwards Aquifer. In fact, Stone Oak and many other areas located north of Loop 1604 are located on top of the Trinity Aquifer and are included in the Trinity Glen Rose District. The Trinity Glen Rose District is responsible for ensuring that the Trinity Aquifer is protected and preserved for use by the community into the future. And as we’ve always found, well-informed water users are always the best allies in making sure our water supply is safeguarded. So, how should you stay up to date on all water matters in your area? The easiest way is to subscribe to the Trinity Glen Rose e-newsletter. In our newsletter, TGR will be supplying great information about how homeowners and businesses can conserve water each day. For example, in the November newsletter, we explain how you should be preparing your landscape for the winter, which in turn makes it ready for the spring growing season. Properly maintained landscapes saves thousands of gallons of water each year per customer. You will also get first notices about new water rebate programs. 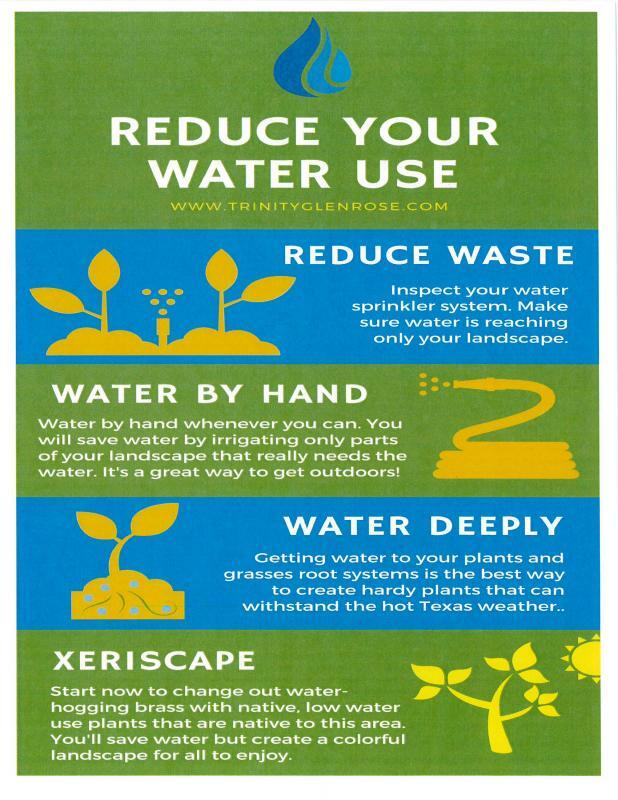 In the spring, we will be partnering with San Antonio Water System on a landscape rebate program. 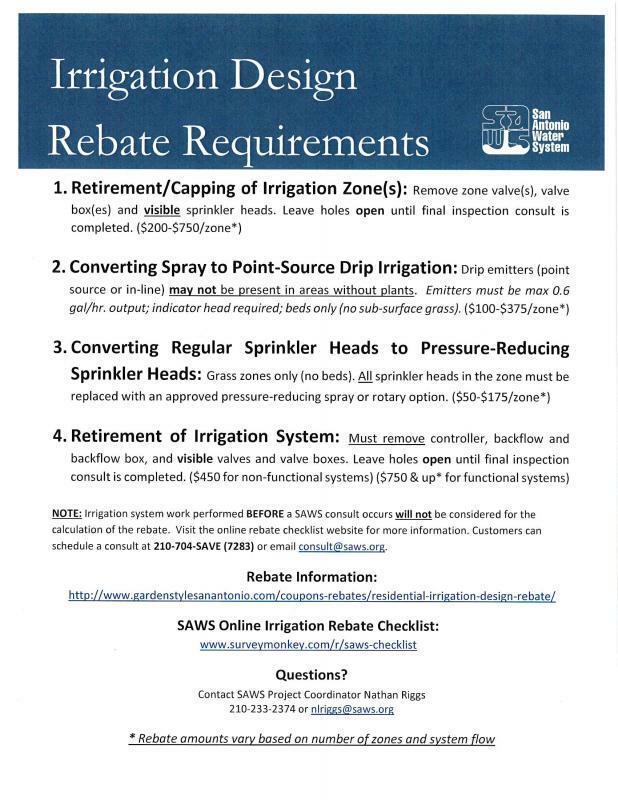 SAWS will be offering a rebate, but Trinity Glen Rose will be adding an additional rebate as well. But, the Trinity offer will only be for the first 200-250 applicants. So, if you’re not on our mailing list, you might miss the opportunity entirely. We’ll also be collaborating with local businesses who are doing great work in water conservation to offer special premiums to people living in the Trinity Glen Rose area. And all of our subscribers will have access to those savings! Those are just a few reasons why we’d love for you to go to our website and subscribe. The information you will receive will always be helpful and to the point. With your help, we can ensure that the Trinity Aquifer is always a quality resource for our community. And that starts with being informed and involved. Thanks so much for your willingness to conserve and protect the Trinity Aquifer. Just go to www.TrinityGlenRose.com to subscribe today. Report Water Waste by visiting http://www.saws.org/conservation/waterwaste/reportform.cfm or calling 704-7283 during business hours or 704-7297 after hours. SAWS will follow up educating the responsible party and monitoring if the problem continues. 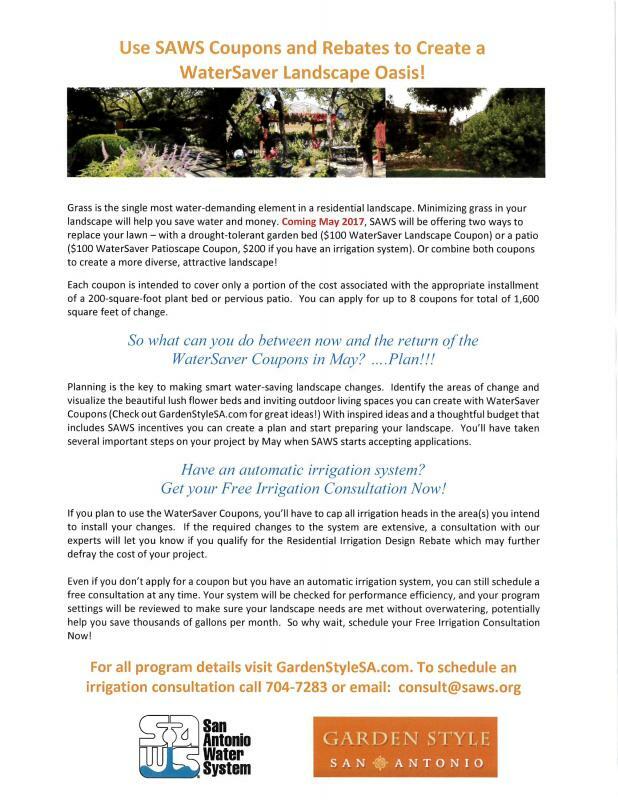 SAWS offers FREE irrigation consults to homeowners and businesses to assist with more efficient irrigation system operation and provide information on our irrigation system rebate and landscape coupon programs. To schedule a consult, call 210-704-7283 or email consult@saws.org. 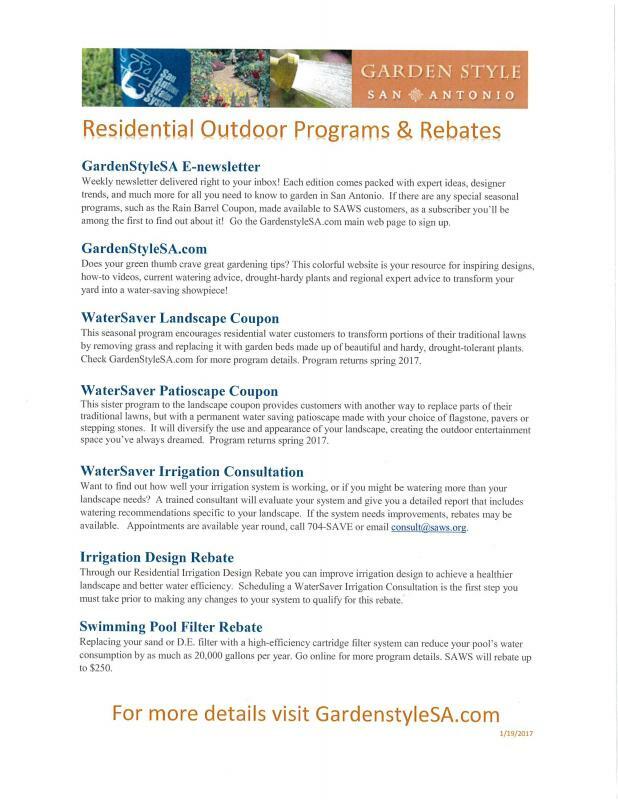 For more information on SAWS Conservation Coupon programs and Irrigation Design Rebate programs, visit http://www.gardenstylesanantonio.com/coupons-and-rebates/. Help us help you by using water wisely and efficiently.